The Genoese Zipper Sinnet is a fusion knot by JD of TIAT(TyingItAllTogether), combining the Single Genoese Bar and the Zipper Sinnet. 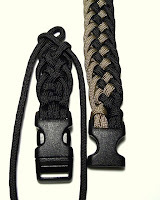 I used about 9 feet of cord, 4.5 feet each of tan and black paracord, in the finished bracelet(9" long to comfortably fit an 8.5" wrist), adding a 5/8" curved/contoured side release buckle. A similar chain sinnet type knotting pattern is seen at this link, a Chinese knot called the 'Big Phoenix Tail Sinnet'. Some folks have said they have trouble with adding the knot work to a side release buckle, so here's a rough photo collage of starting and finishing with a side release buckle, once you're familiar with the knot work from TIAT's video. I had been asked if this knot can be done with a single strand of paracord, and the answer is, 'almost'. You have to simulate a second pair of working strands, since the Genoese Zipper Sinnet has four working strands. To do this, I start with the the two strands and a zipper sinnet(chain sinnet), then to simulate the second pair of working ends, each cord will go down through the previous knot, then back up to make the sinnet, which creates the outer loop effect. It's not identical, but looks similar. Stormdrane..that black comes out as blue to me in the pics. The sunlight coming in the window does give it a bluish tint. I tried editing the photo, but when it got 'darkened' to black, the black cords looked like a dark mass instead of being able to differentiate the strands. Cool! I think I'm gonna have to try this one soon. However, I always have (some) difficulties with the ends, when I try to finish them. Is there a way to place (examples) on how to end these correctly? (or do they) ~ have a set standard which is common with all bracelets and watch bands? With this type of knot, where there are multiple working strands after looping onto one end of a side release buckle, once you have the knotted length you want, the strands all go around the other buckle end, and the outer strands are knotted around all the other strands, at the end of the knotted length, with a single square knot/cobra stitch/Solomon bar/Portuguese sinnet knot. Looks like the perfect knot for making bracelets using two different colors. Even after watching the video I am still a bit stumped on how to start and finish it with a buckle... Could you make one of your awesome photo montages? I like the photo collages you've published on a few of your knots and I wouldn't mind seeing them on all your knots. Sure makes it easy to just print up a page and refer back to it as I go along instead of forwarding and reversing through videos to see what's going on. Seeing the video one time or two times is great but, when I get down to it, I like to have the collages. Wearing my black and tan genoese zipper sinnet bracelet today. Any idea where you can get the web buckles with the hidden handcuff key??? where do you get your clips from? The side release buckles used for the bracelets, came from Creative Designworks. For the bracelets, I usually use 3/8", 1/2", and 5/8" sizes. Stormdrane, the last picture in the collage looks like a repeat of the first picture. I've built this, and have the final knot to hold it onto the buckle, but don't know what to do with the 4 strands after wards. The next to last picture using the forceps is difficult to see what you are doing. I tried searching for videos on how to attach the buckles, but didn't find anything. Can you provide any help? Thanks! After you've tied the last knot, take each of the four remaining strands, and work them under a few of the knots of the underside of the bracelet. I use the hemostats to pull each of them under a couple of the underside knots, before trimming the ends off and quick melt the ends with a lighter, to prevent fraying. The finished ends can then be tucked under and out of sight. That usually works fine as a finish, but you can further secure the ends with a little needle and thread, or a drop or two of super glue. Thanks for the description. I will have to give it a try...do craft stores (like Hobby Lobby) carry the hemostats? I don't really want to place an online order for $5 just to get some. It looks like a lot of your bracelets have fairly flat ends where they attach to the buckle...hopefully mine will be similar. Looks like you may have left more "un-knotted" line before the entry into the buckle than I did, so it may make getting the ends into the knots easier. I may have to loosen mine up. Your site is awesome, love seeing all the new things you find or come up with. Some craft stores do carry hemostats/forceps, and they can also be found in fishing/tackle sections of sporting good stores, and Army/Navy surplus stores. I've found that the smaller/thinner tipped the ends of the hemostats/forceps, the better. Larger tips are harder to work under previously tightened knots, to pull cord under. 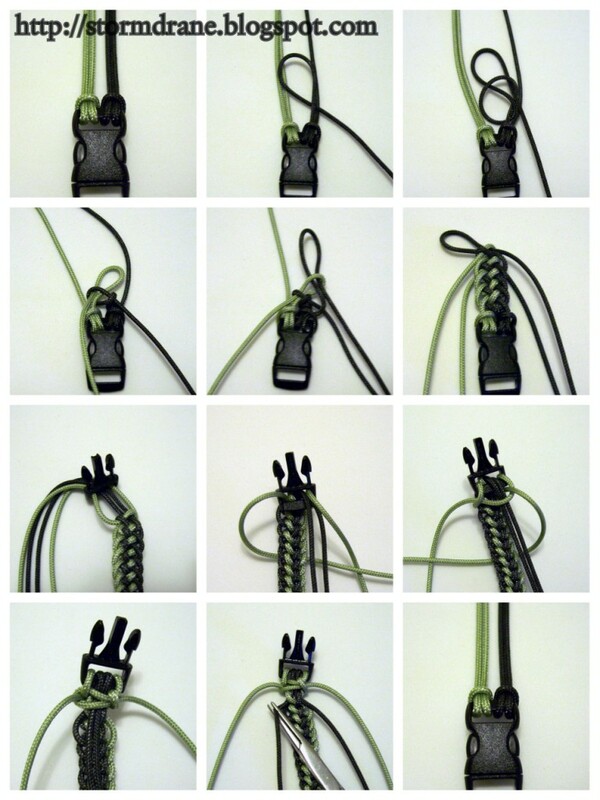 @cibbis, You can always use the video tutorial by TIAT to learn the knot, and any photos posted can be enlarged/reduced in size, by using the CTRL and +/- keys on your keyboard. I just tried this tonight, but without the buckle. It came out a bit uneven, especially at the loop, but for a first try it wasn't too bad. Just wrapped up a para-bracelet (common) tut you did on another site. I did modify the ends to wrap back through the buckle and outer weave before melting.. needless to say, seamless! This is my next project, between the photos and the descriptions you've placed in the comments (hint to those that don't know how to finish), should be a breeze. Which size buckles are those? 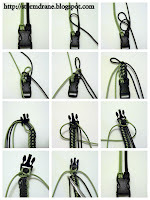 I use 3/8" buckles, and they are wayyyy to small to make two knots on. Do you have any tips for a small buckle? 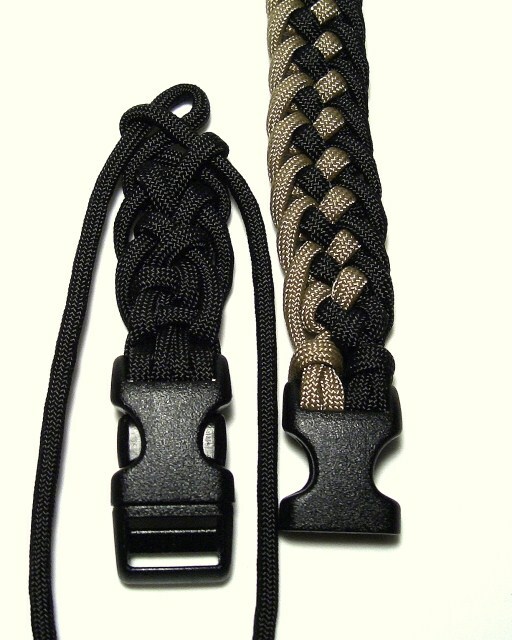 @fragite, I used 5/8" side release buckles for this type paracord bracelet. The 1/2" has just enough room to squeeze 4 strands of 550 cord through it. It's tight but if you use hemostats to squeeze 2 and 3 strands to one side it works fine. I like the 1/2" with the 2 slots on one end. Seems to allow for some extra options. I plan on making this a watchband. DO you know how I could hook the watch buckle to the band? Пожалуйста, оставьте ссылку на то, как закончить браслет. Он получается просто громадный.